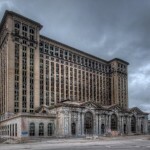 One of the coolest and most depressing buildings in Detroit has to be the old Michigan Central Station (Depot). The station was used by Amtrak until 1988 when it was abandoned and left to basically rot. The station consists of the main railway facilities as well as an 18 story office tower. The interesting thing about the office tower is that the top floors were never finished. Anyway, the building has been decaying for years and has been threatened with demolition many times. As I was going through my Lightroom catalog recently, I ran across a series of shots that I took on the Detroit edition of Scott Kelby’s Worldwide Photowalk from 2009. 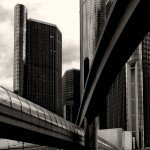 Yesterday’s image of Detroit’s Renaissance Center was taken on the 2008 edition. This shot was taken at the end of the walk as I was walking around the Ren-Cen to see what other angles might be interesting. 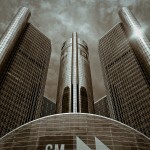 I had seen an image of the Renaissance Center on Flickr which was similar to this so I thought I would try. What attracted me to the shot on Flickr was that it reminded me of a shot by Michael Kenna of the Rouge Plant in Detroit. I really liked the criss-crossing elements and when I found this angle I knew I had what I wanted. The combination of the towers of the building, coupled with the people mover track and the pedestrian walkway also made me think of the visions of the future that people had in the early 20th century. I wish there had been some low hanging clouds or something to add a bit more atmosphere to the shot, but I still like it. he Michigan Central Depot in Detroit, Michigan is such a perfect analogue to the city of Detroit. It was once a beautiful place but it has been allowed to decay. The building has been threatened with demolition for years, but so far it remains standing. Some good things are happening, at least in the surrounding area. Private organizations are working to clean up the park in front of the station. In addition, they are buying up buildings and either demolishing or attempting to rehabilitate them, depending on their condition. The depot itself is a favorite location for film shoots and has been featured in movies such as ‘The Island’ and ‘Transformers’ among others. It’s a shame that the best feature of the building is it’s decay, but if it helps raise awareness about the building that is probably a good thing. 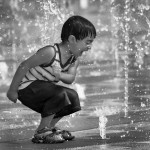 It’s hot here in Michigan, and elsewhere throughout the US, so I thought it appropriate to post this image of a child cooling off in a fountain. 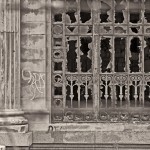 The picture was taken in 2008 during Scott Kelby’s Worldwide Photowalk held in Detroit, Michigan. The fountain is located along the Detroit riverwalk, just behind the Renaissance Center. I took a short trip into Detroit to try out my new camera and a rental lens. I decided to get some more shots of the abandoned Detroit Central Railway Station (or Depot). The building has been abandoned for several years, but the beauty of the structure remains. I certainly hope that something can be done to save a least a portion of this building. 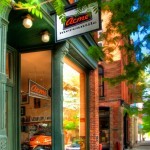 On Liberty Street in Ann Arbor, Michigan is a terrific little store with a variety of interesting merchandise. The store is Acme Mercantile. I took this shot of the storefront on a morning walk through town. For some reason I was in the mood to take storefronts that day. Most of the images I shot on my walk were taken with the potential to make an HDR image. I set my camera to shoot 5 bracketed exposures, 1 stop apart. I was doing this hand held and I set my camera to fast shooting and clicked off 5 quick shots at various exposures in an attempt to minimize movement. Of course, one problem was that it was windy that day, so any thing which could be affected by the wind (like leaves on a tree) created motion that I didn’t want. 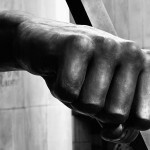 ‘The Fist’ is a sculpture made in tribute to Joe Louis aka ‘The Brown Bomber’ and sits in the middle of a busy intersection in Detroit, Michigan. The 24 x 24 x 11.5 feet Monument to Joe Louis was commissioned by Time Inc. for the City of Detroit to honor Joe Louis. It was created by sculptor Robert Graham and installed at Jefferson Avenue at Woodward, Detroit on October 16, 1986. Over the years the artwork has been the subject of controversy. 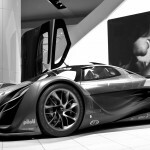 This shot was taken at the 2008 North American International Auto Show. The Mazda display had a video screen which showed a variety of images and I thought the juxtaposition of the mother/child as a backdrop to a high speed sports car was an interesting mix. Afterwards I noticed the gentlemen on the left side which I also think add something to the shot. The original was color and I converted it to black & white using Photoshop. This sculpture is named ‘Transcending’ and it was a gift by Detroit labor unions to the city to honor Detroit’s 300th birthday. 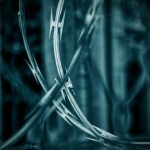 I took this shot during the Detroit edition of Scott Kelby’s Worldwide Photowalk. 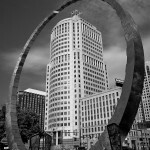 The sculpture is located at the edge of Hart Plaza which is located along the Detroit riverfront. Our photowalk took us along the new Riverwalk which runs along the Detroit River. In the summer, it makes for a pleasant trip.